PDF version is on sale for $10. Innovative line by line English, Transliterations, and Hebrew ever published. Beautiful 8×10 layout. Perfect for the beginning and advanced davvener alike. Large type. Egalitarian translations. Alternative translations. Kabbalistic prayer charts. Full chant services. Full traditional services for weekday and Shabbat davvenen. Prayers for Hanukkah, Passover, and songs for Festivals. Traditional and alternative blessing after meals. Songs and translations by some of the most creative rabbis and teachers: Rabbi Zalman Schachter-Shalomi, Rabbi Shlomo Carlebach zl, Rabbi Shefa Gold, Rabbi Aryeh Hirschfield zl, Rabbi Ya’acov Gabriel, Rabbi David Zeller zl, Rabbi Hannah Tiferet-Siegel and many more. Serve the Holy One with Joy! Imagine a siddur (prayerbook) with every line of Hebrew transliterated and translated line-by-line! to feel fully included in the service! Imagine a siddur filled with beautiful, egalitarian translations! Imagine a siddur filled with the songs of Renewal’s most creative lyricists and poets! 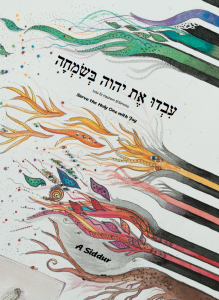 Used in many Renewal communities and synagogues that need a complete siddur for their regular alternative, creative, or ruach-styled minyans. All the daily blessings, Havdalah, and more!